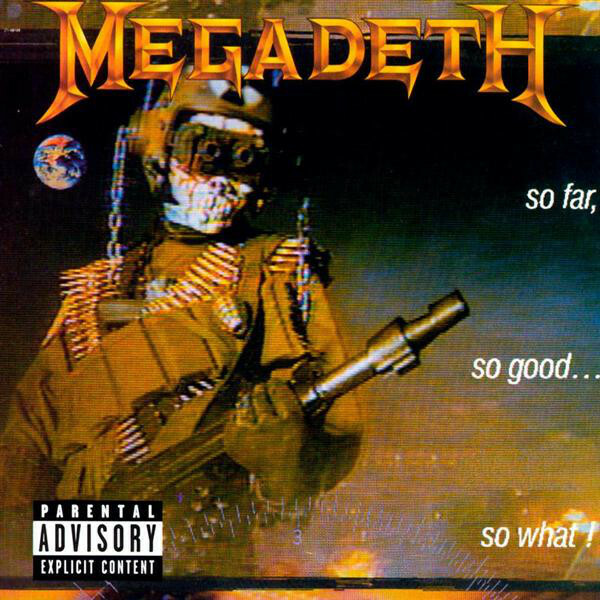 Home » Features » MEGADETH’s So Far, So Good… So What! turns 30 years old….but is it one of their weakest efforts, or their most underrated album? MEGADETH’s So Far, So Good… So What! turns 30 years old….but is it one of their weakest efforts, or their most underrated album? One of Megadeth’s weakest efforts? Or their most underrated release? Megadeth‘s third album, So Far, So Good… So What! turns 30 years old today and it remains one of their most divisive albums. Of course, being sandwiched in between two of thrash metals greatest ever collections (1986’s Peace Sells…But Who’s Buying? and 1990’s Rust In Peace) doesn’t help matters but this shouldn’t deter from examining the music in its own right….. This album is the sound of primal rage let loose, with all of Mustaine’s demons congregating in the one place and primed to unleash armageddon on an unforgiving world. Renowned for being behind tight – a weapons-grade, precision-tooled, nuclear-warhead of a band with insane technical ability – Megadeth sounded unhinged here, as if Mustaine’s world was falling apart and his only response was to come out snarling, brawling and bound for self-destruction. Extremely effective instrumental opener Into the Lungs of Hell sets a high standard but it’s “Set The World Afire” that ravages the ears like no other track in Megadeth’s arsenal. It’s pure thrash perfection, utterly feral and driven by a sense of derailing chaos led by the palpable pairing of Mustaine and ‘new kid’ Jeff Young. “In My Darkest Hour”, the most heartfelt track of Mustaine’s prestigious career, is a triumph that showcased another side to Megadeth’s talismanic figure and one that represented the heart and soul of this often misunderstood frontman. Torn apart by the news of Cliff Burton’s passing, you can still hear the crackle of emotion in this thrash ballad par excellence. Both “Liar” & “Hook in Mouth” are underrated ‘Deth classics, thrashing hard and exhibiting Mustaine’s rage in the most succinct manner possible. It’s left to Megadeth’s bloody good cover of “Anarchy In The UK”, “502” & “Mary Jane” to fill the holes but they’re anything but filler. Despite the haphazard nature of So Far, So Good… So What! and the fact that it doesn’t exactly flow as seamlessly as their previous material, it’s still an impressive experience, 30 years after release. The original mastering of So Far, So Good… So What! may be muddied and heavy on the reverb but it’s still the go-to version, capturing the mindset of Megadeth during this period and providing the antidote to the sometimes overly clinical approach of Rust In Peace. While So Far, So Good… So What! may not be as essential as Peace Sells…But Who’s Buying? and Rust In Peace, it is an essential 80’s thrash album and one that should be revered as a challenging, yet bullish minor masterwork from one of thrash metal’s greatest ever bands. Happy 30th birthday So Far, So Good… So What!, you underrated album, you! Bloodstock walks the perfect middle ground between event size and calibre of band. War is hell....and so is listening to this! Another line-up....but Sodom march on!